Next to math, science is my older kid’s favorite subject. 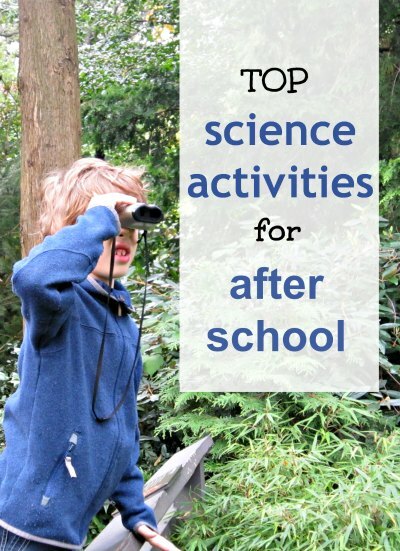 After school science learning activities are a good way to nourish his interests. But the thing about doing projects after school is that they have to be super low prep. After all, kids’ brains are not at full power in those late afternoon and evening hours. But of course birding is not something we can do everyday, so I’ve curated this list of ideas for you that are easy science experiments that double as boredom busters and may even give parents a bit of a breather as kids explore scientific concepts in a deeper way on their own. Water refraction experiment. This easy after school science idea requires almost no prep at all and kids will love the magic, especially if they design their own images to reverse. Water drop races. Kids will barely even realize they are learning about science as they propel H2O towards the finish line. All you need is waxed paper, straws and water and kids will be well on their way to learn all about surface tension. Make a thaumatrope. What’s a thumatrope, you ask? It’s a groovy old fashioned toy that is simple to make, but the possibilities for kids coming up with their own designs are endless. Kids will learn about the science of visual perception and motion while having a blast. Cabbage juice science experiment. This requires a bit of prep on the part of a parent but if you set it up to be ready when the kids come barging in the door, it will provide entertainment for a long, long time! Magic jumping coin. All you need is a glass bottle, a coin and some water. Kids will experiment to learn how temperature affects energy and force. Plus, it is a little bit amazing. Set up a pulley. Once you hang up a pulley somewhere in your home (or outside!) this can be a totally hands-off project for parents (depending on the age of your child). It is amazing how fun experimenting with a pulley is! Plus kids will be learning about the science of simple machines! Make and fly paper airplanes! Paper airplanes are actually a great STEM activity and a perfect playdate science activity for after school. They teach about physics, engineering and the science of design. As a bonus extension, set up creative airplane landing strips and have a flying competition. Snack taste test. This may seem a little crazy but why not make snack time into science time. Learn all about the science of taste! We did this will apples, but you could do this with different kinds of dips, or crackers or varieties of fruits and vegetables. Make fog in a bottle. 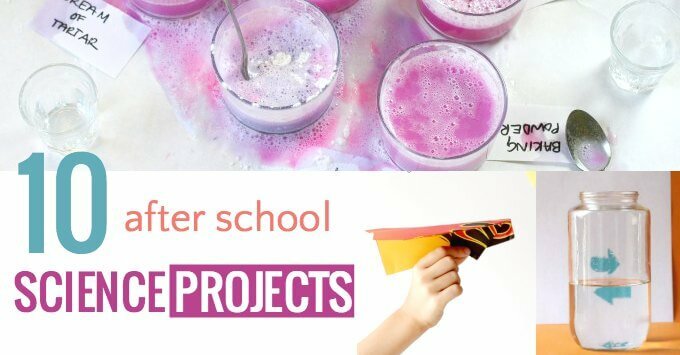 This very easy after school science project will teach kids about weather and condensation. Best of all, all you need is ice, a jar, water and a plastic bag. Explore magnets! You can do this in a few ways. Try using a magnet wand to pick up object to learn about what is magnetic and what isn’t or create a magnet container busy jar, which is great for younger kids (but remember always supervise children when playing with magnets). You can even paint with magnets. Set up balloon rocket races. I know from experience that you can do this indoors when the weather is uncooperative. Set up the course between two chairs. Kids love to race the balloons up and down the length of the string. A little parental involvement might be necessary for kids who can’t blow up balloons by themselves, but it’s worth it for the screams of laughter. I am so impressed that Kiddo continues with his love of birding. It’s fun when they develop true passions for something and can become experts in the subject of their choice. I think it is awesome that your son is so into bird watching. Such fascinating animals!